FINGER Print Door Access Control. This device can be connected with a magnetic lock / electronic lock or bolt lock. When the enrolled fingerprint punch,the door will open. For the detailed connection, we can send you detailed instruction. The powerful management software is designed to read attendance record from the terminal or USB stick, to set your checking rules, to calculate worked hours, and to generate various kind of statistical reports. 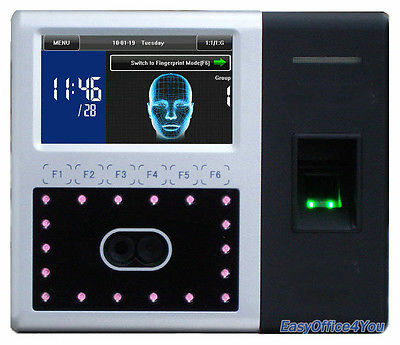 This multi-biometric identification time attendance and access control terminal is a high tech security device that uses your face or fingerprint as ID! Adopts the latest BSM800 platform with Face 7.0 algorithm and large capacity memory. This Face series integrated 630MHz high speed Multi-Bio processor and dual high definition infrared camera enables user identification in the dark environment. Face and fingerprint multi-biometric identification method will be applicable more widely. All operations of Face are designed to be performed on the 4.3 inches TFT touch screen. Multi-model communications includes RS232/485, TCP/IP. It's ideal for high security applications such as factories, warehouses,hospitals, laboratories, data rooms, banks, offices, and more! In one word, this item is a complete time attendance and access control system using face recognition technology to instantly identify employees. Employees simply look at the clock and within seconds they are identified and clocked in for work! All of this make it the most reliable and well-designed biometric device available!!! - Facial and Fingerprint identification Two In One! - Infra-red optical system enables user-identification in poorly lit environments. - Have access control compatible with the 3rd party door sensor, alarm, exit button, wired bell and electric lock. - Uses a standard Ethernet connection to your existing computer network.